Developed specifically to explore the possibilities of multi-color, multi-material 3D printing, the starting point for Zaha Hadid Architects (ZHA) was to design a relatively lightweight chair that made use of its geometry, detailing and manufacture to highlight and improve its performance. Investigating the design potentials of the structural optimisation process, ZHA considered the loading condition of a person sitting down, and used the optimisation results to create a structural pattern that deploys material density and depth where structurally required. With the advanced capabilities of Stratasys’ Objet1000 Multi-material 3D Printer, the designers were then able to translate these structural elements into the design. 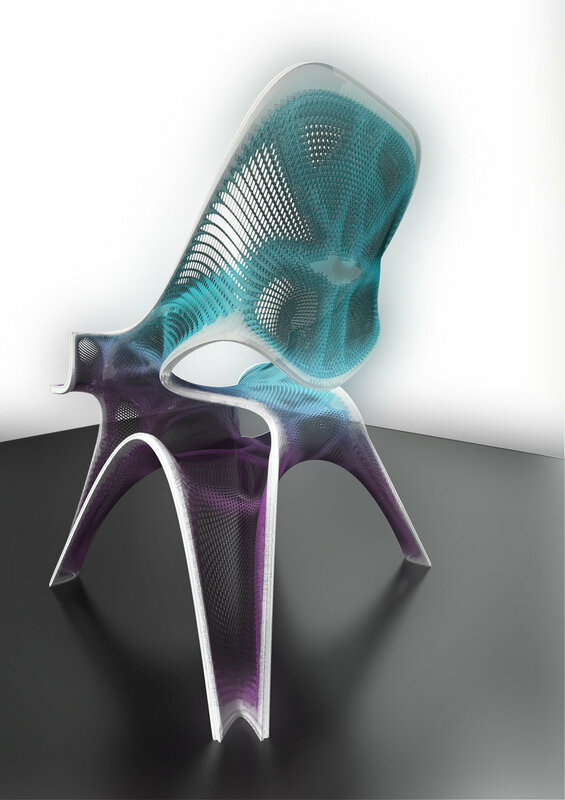 Stratasys were able to 3D print the chair using gradations of color and opacity, from transparent to opaque cyan, to represent the structural performance of each area of the chair. Since the development of the original 3D printed prototype in 2014, the chair has been recreated in several different colours and variations. Developed specifically to explore the possibilities of multi-color, multi-material 3D printing, the starting point for ZHA was to design a relatively lightweight chair that made use of its geometry, detailing and manufacture to highlight and improve its performance.